The United Arab Emirates (UAE) is keen to strengthen its bilateral relations with Bangladesh and invest in different sectors of the country. 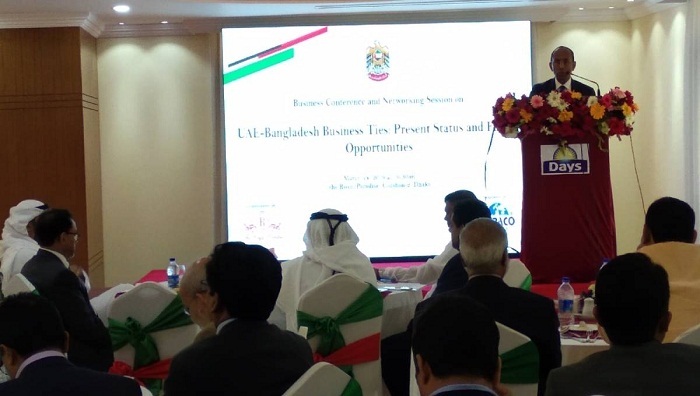 Saed-Mohaamed Al-Mheiri, Ambassador of the UAE to Bangladesh, on Sunday expressed the interest while speaking at the Business Conference and Networking Session on “UAE-Bangladesh Business Ties: Present Status and Future Opportunities” at a hotel in the capital. “UAE is enthusiastic to invest in different sectors in Bangladesh and the country would like to extend its hands to businesses of both countries for expanding business size,” he said. “Bangladesh has set an example in the world by providing shelter to Rohinyga Muslims in the country and the UAE extended wholehearted support on the humanitarian ground,” he added. Kazi M. Aminul Islam, Executive Chairman of Bangladesh Investment Development Authority (BIDA)said the relation between the UAE and Bangladesh is excellent.The recent visit of Prime Minister Sheikh Hasina to the UAE has given a new dimension in the brotherly ties, he said. “Recently the two friendly nations have signed several memorandums of understanding (MoU) on economic cooperation. Bangladesh is now a unique platform for foreign investors, the return on investment is very high rest of the world, we will eagerly accept any type of investment and we will eliminate if there are any barriers in the way of investment,” he also said. The Embassy in association with Intraco Group and Royal Paradise organized the get-together event while AltapHossen, Economic Analyst of UAE Embassy read a keynote paper. Businessmen from both countries discussed the current trends of trade and investment, success stories, operational problems and challenges of doing business, future growth prospects and prioritized cooperation areas. They also expressed their opinions and propositions that would mutually benefit both countries. The Deputy Head of mission of the UAE Embassy in Bangladesh Abdulla Ali AL Hmoudi, Managing Director of Intraco Group Mohammed Riyadh Ali, Emirates Airlines Country Manager Saeed Abdulla AL Miran, Vice President of Dhaka Chamber of Commerce and Industry (DCCI) Imran Ahmed, Chairman and Managing Director of AL Haramain Perfumes and Chairman NRB Bank Mohammed Mahtabur Rahman, Dr SM Akbar, Managing Director of UAE-Bangladesh Investment Company Limited (UBICO) and among others spoke there.